Horand von Graftrath aka Hektor Linksrheim - the first German Shepherd Dog. The German Shepherd (German: Deutscher Schäferhund), also known as an Alsatian, is a breed of large-sized dog that originated in Germany. German Shepherds are a relatively new breed of dog, with their origin dating to 1899. As part of the Herding Group, German Shepherds are working dogs developed originally for herding and guarding sheep. Because of their strength, intelligence and abilities in obedience training they are often employed in police and military roles around the world. Due to their loyal and protective nature, German Shepherds are one of the most popular breeds. In Europe during the 1800's, attempts were being made to standardise breeds. The dogs were bred to preserve traits that assisted in their job of herding sheep and protecting flocks from predators. In Germany this was practiced within local communities, where shepherds selected and bred dogs that they believed had traits necessary for herding sheep, such as intelligence, speed, strength, and keen senses of smell. The results were dogs that were able to perform admirably in their task, but that differed significantly, both in appearance and ability, from one locality to another. In 1899, Von Stephanitz was attending a dog show when he was shown a dog named Hektor Linksrhein. 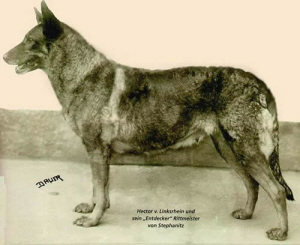 Hektor was the product of few generations of selective breeding and completely fulfilled what Von Stephanitz believed a working dog should be. He was pleased with the strength of the dog and was so taken by the animal's intelligence, loyalty, and beauty, that he purchased him immediately. 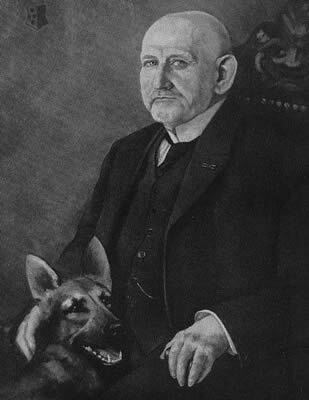 After purchasing the dog he changed his name to Horand von Grafrath and Von Stephanitz founded the Verein für Deutsche Schäferhunde (Society for the German Shepherd Dog). Horand was declared to be the first German Shepherd Dog and was the first dog added to the society's breed register. Horand became the centre-point of the breeding programs and was bred with dogs belonging to other society members that displayed desirable traits. Although fathering many pups, Horand's most successful was Hektor von Schwaben. Hektor was inbred with another of Horand's offspring and produced Beowulf, who later fathered a total of eighty-four pups, mostly through being inbred with Hektor's other offspring. In the original German Shepherd studbook, Zuchtbuch fur Deutsche Schaferhunde (SZ), within the 2 pages of entries from SZ No. 41 to SZ No. 76, there are 4 Wolf Crosses. A question we often get asked is what is the difference between an Alsation and a German Shepherd? The answer is nothing, it's the same breed of dog. During the out break of world war it was deemed un-politically correct for the British and allied forces to be using a dog called a German Shepherd so the name was change to "Alsation" The name comes from a small region in France called Alsace. The Alsation name is slowly being dropped and the breed is once again known as The German Shepherd.